Over the tiny bridge in Woodstock, as you're walking toward the library, there is a happy little store with happy workers, which not only holds some of the nicest logo designs and local artwork around, but is actually managed by one of the artists himself, Mike DuBois. DuBois is noted for his recognizable style, that goes along with the makings of old 60's concert flyers, mingled into his own creations of psychedelic art and visions. He has done work for such artists as The Grateful Dead, The Rolling Stones, The Allman Bros. Band, Santana and The Wailers to name a few. He also has made flyers for local concerts such as Mountain Jam and Gathering of the Vibes, even the album cover for Levon Helm's "Electric Dirt" which went on to win a Grammy in 2010. WOODSTOCK, NEW YORK - The artworks of Mike DuBois are well known throughout the music-art community and beyond, he is broadly admired and often described as visionary in the artistry of "music/concert" poster art. He applies his unique style as a poster illustrator, painter, fantasy artist, and tie-dyed t-shirt producer and has built a unique brand, having created artworks for such legendary artists as Grateful Dead and the Jerry Garcia Band (of course), Pink Floyd, The Allman Brothers, Santana, The Rolling Stones, Neil Young, Black Sabbath, Michael Hedges and Hot Tuna, just to name a few. The vibrations from drummers Mickey Hart and Bill Kreutzmann felt like a jackhammer on my head. Guitarist and vocalist Bob Weir growled like a bear and roared like a tiger. And singing along with more than 10,000 people inside Madison Square Garden was simply too much fun. Stealing the show, however, was Woodstock artist Mike DuBois, a fellow SUNY New Paltz graduate whose artwork is being used by Dead & Company on their current tour as part of their stage design. DuBois also designed posters for concerts on the tour, including the one at Madison Square Garden. When retired NBA star Bill Walton was looking for an artist to help him craft the look of his new memoir, he turned to a Woodstock resident who graduated from the State University of New York at New Paltz. "I'm excited and happy and proud to be a part of this," Mike DuBois said. "Bill was so gracious with me. He's an incredibly nice guy." 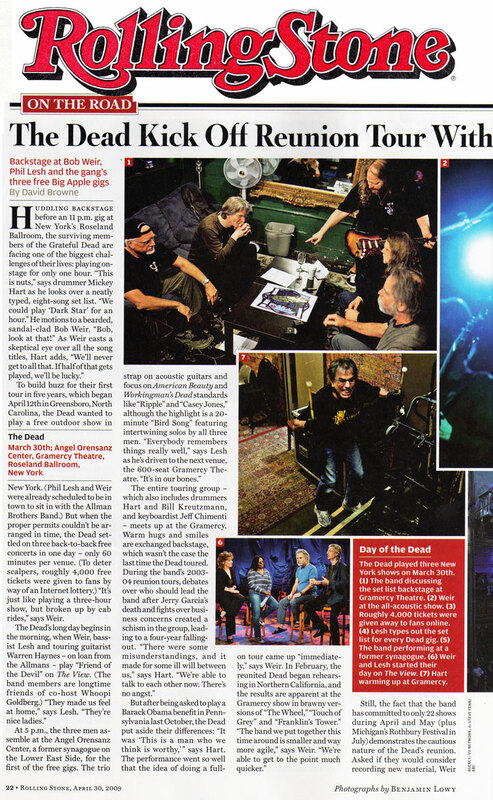 July 9, 2015; Poughkeepsie Journal: Hudson Valley artist helped shape Grateful Dead memories. Many bands are instantly recognizable for their sound, but when it comes to the Grateful Dead or The Allman Brothers Band, the imagery that adorns their albums and merchandise may be just as iconic. That's where artists like Michael DuBois come in. 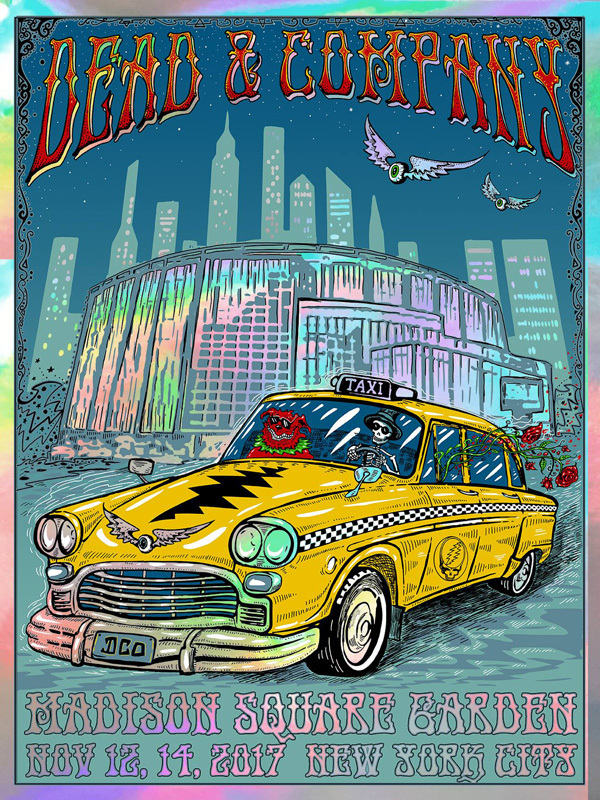 In true Prankster fashion, the band Furthur, featuring ex-Grateful Dead members Phil Lesh and Bob Weir, commissioned a commemorative poster for their two nights sold out shows this past December 30th and 31st 2010. The stellar shows were held at the Bill Graham Civic Auditorium in San Francisco. The poster is an "illusion" tricking the mind into thinking what you're seeing is really 3D. Created using a process called "lenticular", the poster was created by Rock and Roll poster artist Michael DuBois, and processed by Ray McDermot. The lenticular process has been around since the 1940's. Recently, 3D printing as a means of advertising has been gaining popularity. To create the 3D effect something dimensional is needed to start with. Using the theme for the shows, "The Circus" where marvelous musicians performed daring musical acts, (the circus of deadheads was indeed in town for the shows) Mike DuBois created 12 images that had to be layered from back to front. Once done, Ray McDermot, who processed the poster, used 40 layers to create the 3D effect. I was one of the 700 lucky people to purchase one of these limited numbered posters. Why didn't the band order more? Many fans would love to know that answer. They could have sold thousands during the shows and more after through one line merchandising. Hopefully next year, we'll be treated to more 3D art. About Michael Dubois: Working in mixed-media, oil painting, and computer graphics, DuBois has established himself as a pioneer in the work of contemporary music art, with commissions by The Grateful Dead, The Allman Brothers Band, Hot Tuna, The Jerry Garcia Band, Michael Hedges, Wavy Gravy, Gov't Mule, The Wailers, Phil Lesh and Friends, Levon Helm, Bob Weir and RatDog, Santana and The Rolling Stones. About Ray McDermot: Good Thoughts Printing started out as a rock and roll poster printer back in 2004. From their humble beginnings in Ray's garage, they have grown to produce amazing posters for such clients as The Dead, Gov't Mule, Widespread Panic, Yonder Mountian String Band, The Doobie Brothers, and many more. To learn more about Ray McDermot and Good Thoughts Printing click here. Early winners on this showcase night for the music industry are being posted pre-CBS broadcast on grammy.com. Here's the scorecard for nominees with Syracuse ties. Two-up, two-down. Banjo star Tony Trischka played on the winning entry for best bluegrass album. A couple of years ago, the Syracuse native included Steve Martin on Trischka's Grammy-nominated "Double Banjo Bluegrass Spectacular." Martin in turn included Trischka on "The Crow," which took the trophy today. Woodstock legend Levon Helm won the Grammy in the best Americana category for "Electric Dirt." Central New Yorker Mike DuBois had a hand in the CD cover design with the man who earned his stripes with The Band. DuBois, who also works on the design of Helm's web site, is a graduate of West Genesee High School. The song "Borat in Syracuse" did not come out on top in the best instrumental category. The piece was written by jazz great Paquito D'Rivera under commission from Syracuse University. And, the latest CD by polka king Jimmy Sturr did not win in the best traditional folk category. Canastota's Al Piatkowski performed on that one. I'll be writing a column for The Post-Standard about tonight's awards show. It'll be posted here on Listen Up later. There are chickens in the yard, mountains in the distance, cold water in the creek and art in his soul. Nestled among the Catskill Mountains in Bearsville, State University of New York at New Paltz graduate Mike DuBois maintains a mountainside studio where he has created art for some of rock 'n' roll's biggest names - the Allman Brothers Band, Santana, Levon Helm Band, former Grateful Dead members Bob Weir and Phil Lesh and the estate of Jimi Hendrix, among others. Many Hudson Valley music fans will travel to Hunter Mountain in June - for the Mountain Jam music festival - and Bridgeport, Conn., in July - for the Gathering of the Vibes music festival. Artwork created by DuBois will serve as an icon for both events and be as ubiquitous there as live music. Music and Art Fair are bedrocks of the region's history and continue to inspire today. But the region's legacy with which DuBois is so closely linked transcends music and art. As a student at SUNY New Paltz, DuBois hiked, mountain-biked and rock-climbed often in the Shawangunk Mountains. And like those artists of the Hudson River School, DuBois drew inspiration from the region's landscape. "The mountains, that was a natural attraction," DuBois said of his discovering the area before enrolling at SUNY. "I still love the 'Gunks. In their own way they were inspirational." As a child, DuBois visited the historic Huguenot Street section of New Paltz, which dates to the late 1600s. Decades later, DuBois learned from his father, who enjoyed researching the family history, that his family was descended from an original settler of New Paltz. "For us to help someone have a better understanding of who they are, where they came from," said Richard Heyl De Ortiz, director of public programs at Historic Huguenot Street, "is incredibly rewarding." DuBois and his family are related to Louis DuBois, who is buried in uptown Kingston. "It feels good," DuBois said of his links to local history. "It's grounding. Me and my one cousin, my father's brother's son, we are the last two males carrying on the name. Now I have two sons." Art seems equally as grounding for DuBois, who grew up in Syracuse and by age 12 was designing T-shirts for local organizations and at 18 was painting murals on the sides of city buildings for the Syracuse Art Squad. At SUNY New Paltz, DuBois focused on metal-smithing and jewelry design. While at New Paltz, DuBois was heavily involved with the college's Innovative Studies Program and Appropriate Technologies Association. The involvement served as a cauldron for his interest in solar power, which he maintains today. Solar panels provide DuBois with 30 percent of his electricity needs - he has his home and studio on the same property - and in the winter, 85 percent of his heating needs are covered by solar power. Back at New Paltz, the organizations DuBois was involved with often staged events to raise awareness of the issues they examined and hosted speakers. DuBois often created posters and promotional materials for these events. After college, using original paintings and drawings, he created a line of greeting cards, which launched his career. "I produced eight greeting cards," he said. "Then people wanted to see things on shirts." DuBois began selling his artwork outside of Grateful Dead concerts, which were legendary for their grassroots vending scenes in the parking lot of concert halls. "One thing led to another," he said, "and I started doing music posters." Around 1990, DuBois created a design for Not Fade Away Trading Co. in Woodstock, which has created and sold official merchandise for the Grateful Dead, Bob Marley, Gov't Mule and many others for years, and that work continues. "We all try very hard to prepare students for life within their chosen field after graduation," said John Cogswell, an instructor in the SUNY New Paltz Metals Department. "It reflects well on the program. It says, 'I was prepared well, they gave me the tools for survival in the field.' It says, 'I am a success story. They helped me get here.' We're a part of the process." "I was always drawing, since I could hold a pencil," DuBois said. "It's something that held my attention, that I liked to do. I like to bring images to fruition."